The 4th Annual American Poker Awards, presented by PokerStars, will be presented on Thursday, February 22nd in Los Angeles. This year’s edition will be presented at the ultra-luxurious Andaz West Hollywood, steps away from some of the most legendary night clubs on the infamous Sunset Strip! A record 20 awards are expected to be handed out as a grand total of 54 finalists will hope to head home with the most coveted awards in poker! 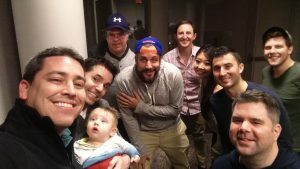 The most talented poker journalists have the ability to connect poker fans with the poker world through articles, live reporting, and photography. Presented to the casino employee, tournament staff member or tour operating worker deemed to have gone over and beyond for the game of poker during the 2017 poker season. Presented to the player judged to have enjoyed a breakout campaign on the live tournament circuit in 2017. A player cannot have won a major poker title prior to 2017. Awarded to the American player judged to have had the single best tournament performance on the worldwide live circuit during the 2017 poker season. Presented to the organization who presented the best Mid-Major Circuit events and festivals during the 2017 poker season. Presented to the event judged to have been the best single tournament event presented during the 2017 campaign. Presented to an individual, organization, venue, tournament or tournament series that raises awareness as well raise funds for a noteworthy charitable cause. Presented to the person judged to have devoted a significant portion of their life to poker; a person who has positively impacted the poker world. These accomplishments will be celebrated with the presentation of this special Award. This trophy is to be Awarded at the Jury’s discretion. Presented to the best poker article, blog post, book, picture or interview published by a journalist, industry member, blogger, player or media contributor during 2017. Presented to the most dedicated poker streamer who continued to provide quality entertainment to their most dedicated fans while attracting and educating the most novice of players. Presented to the best poker broadcaster in the business. Presented to an online poker legend who has also made significant contributions on the live tournament circuit. Presented to the individual who moves the needle most in the poker world. Whether it’s a player, an industry member or even a celebrity, this Award winner is judged to have been one of the biggest influencers in the game in 2017. 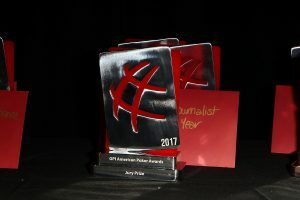 A special Award may be presented by the members of the Jury to a person, group or organization who deserve special recognition for their contributions to poker in 2017.